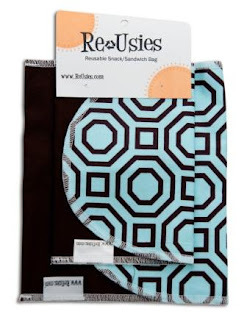 Lil' Blog and More: Review and Giveaway: ReUsies! 1 Winner- Ends 2/4-US Only! Review and Giveaway: ReUsies! 1 Winner- Ends 2/4-US Only! For my review from ReUsies, I received the Hollywood 2 pack. These are amazing! ReUsies have to be the one of the best inventions of our time. Right now our landfills are overflowing, and we just have so much trash. Well with the help of ReUsies, we can start to make a HUGE difference! I cannot count how many plastic baggies my household has used. I wish I could go back to when I was 10 and get these. When I was in school I seriously packed my lunch EVERY DAY. I would have a turkey and mustard sandwich and pretzels or some other type of snack everyday. So everyday I used at least 2 sandwich baggies. I also threw out 2 sandwich baggies everyday. So just think, 180 days each year from 5th grade to 12th grade. (2 baggies each day,so 180 x 2 = 360) 360 X 7 Years = 2,520 bags AT THE LEAST! Thats a lot of bags! Well ReUsies are the solution for the newest generation! ReUsies are just like plastic bags. You put your food in them, keep the food fresh and eat :) You can spot clean your baggies with a wash cloth and water, or if you make a mess, you can simply wash them in the Dishwasher or with the Laundry. ReUsies are available in 2 different sizes. Sandwich size and Snack Size; You can also purchase a Two Pack for $15.90. Also, think about how much money you would be saving! Plastic baggies really add up! You can buy a few different ReUsies, and be done forever. Thats it! You'd never have to buy another plastic baggie again! Buy a pack of ReUsies today and start helping the world with your small part today! 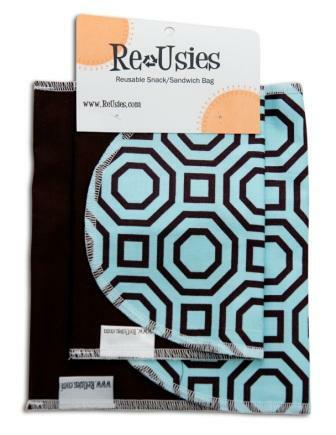 It's hard to believe that one small thing like a ReUsie could replace thousands of plastic sandwich baggies! There are over 40 different designs available! ReUsies are AMAZING! I recommend them to anyone! 1 of you will receive a two pack of ReUsies! Mandatory entry: Visit the ReUsies Website and tell me your favorite pattern! ﻿Disclosure: Review product was provided to me free of charge to ensure and honest review. All opinions expressed are my own, and were not influenced in any way. Only 1 entry PER HOUSEHOLD. Be sure to leave your email address in each comment. Prize is being provided by ReUsies! The Chopstick is my favorite, but I also like the Lime Flower. Thanks for the review and giveaway! I like the Camo and Chugga Choo patterns. I am a new follower on GFC from the Monday Blog Hop. I hope you will stop by and check out the blog and giveaways. My favorite pattern is the chopsticks sandwhich one! I like the Camo pattern. I follow you through Goggle Friend Connect! I like the Seattle Rain print. I follow ReUsies on twitter @Aerated. I like the DiscO pattern. My favorite pattern is the soccer ball black. I love the 'Eco Mod' design. Thanks for the giveaway. Entered the 'Tribe Origins' giveaway. I like the camo best! My Fav pattern is the Limeade Pattern. I signed up for the ReUsies newsletter! Friend of ReUsies on FB! I like the "Take Flight" pattern! Entered Smarty Had A Party Giveaway! I like the Hollywood pattern. My fav is the fruit salad print!